Bullet Proof Touring: A job for Alpinestars Glove Fire Power! 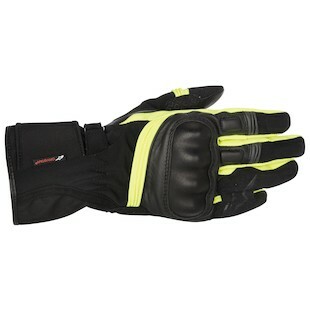 New for the spring of 2014 are two bullet proof touring gloves; the Valparaiso Drystar and Stella Equinox Xtrafit. The Valparaiso Gloves are the last piece to the puzzle for those of you looking to complete the full Valparaiso get up. 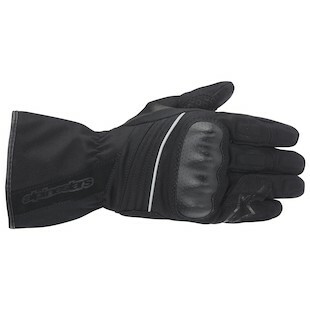 The Stella Equinox on the other hand, is Alpinestars’ home run of a Gore-Tex X-Trafit glove for the ladies. We have recently fallen in love with Alpinestars’ Valparaiso jacket and pants so it is great to see them completing the set with matching Drystar gloves. Following the trend in materials, the Valparaiso gloves ($109.95) utilize a lightweight yet abrasion resistant textile upper with a goatskin palm, reinforced with suede in high impact and abrasion areas. Alpinestars is also using the tried and true 3rd and 4th finger bridge designed to prevent against the hyperextension of the little finger upon impact. Available in an all Black, Black/Gray, and Black and Hi-Viz color combination, the Valparaiso will have a color combination suited for your outfit. Equipped with hard knuckle armor, a Drystar membrane, a full gauntlet, and a visor wipe, the Alpinestars Valparaiso Gloves are the perfect protective tactile touring glove for riders under a budget. Let’s be honest, the Gore-Tex glove options for ladies is far from expansive. Thankfully, just under 2 bones, the Alpinestars Stella Equinox Gloves are equipped with Gore-Tex’s X-Trafit technology for an awesome feeling, thin fitting, waterproof yet breathable glove. Similar to the Valparaiso, the Stella Equinox is using a stretch nylon material for the upper while having a palm constructed of supple goatskin. The Equinox will only be available in black, but will have reflective accents for night riding. Although color choice is limited, it is sure nice to see a technical ladies glove lacking pink and purple colorways. Also clad with hard armor and a visor wipe, Alpinestars intends this to be a perfect touring glove for long distance, all-weather riding. Lightweight, waterproof touring gloves seem to be the theme here, but without compromise to protection. Whether you need a glove to get you across the country, or a reliable glove to protect you on your day to day commute, the Valparaiso and Equinox will take care of any task at hand.